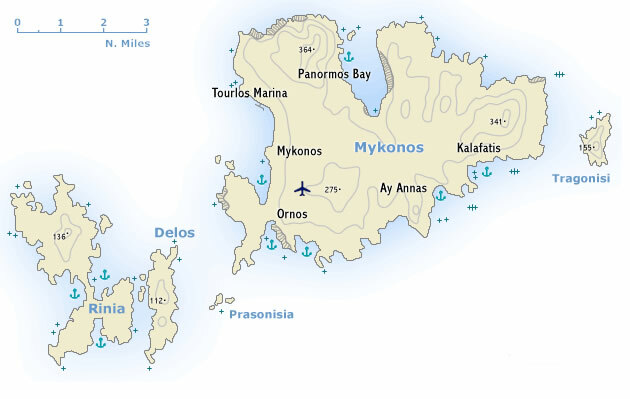 According to legend Mykonos was the rock with which Poseidon slew the giants. The island’s history was closely bound up with that of Tinos. Unlike Tinos, however, it was occupied by the Turks, though it contrived to maintain a considerable degree of independence under Turkish rule. 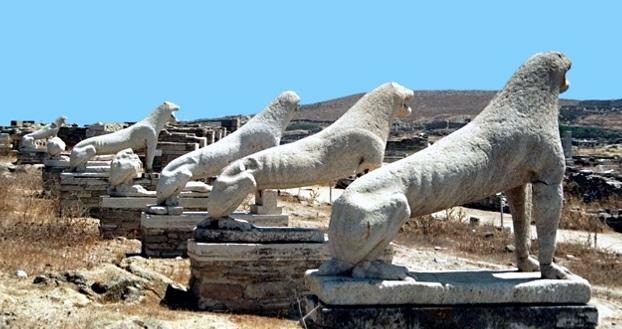 The earliest settlers on Delos, in the 3rd millennium BCE, were Phoenicians and Carians. After their displacement by Ionians in the 1st millennium BCE the island became the main centre of the cult of Apollo, and splendid games – said to have been originally established by Theseus – were held annually in honour of the god. In the 6th c. BCE Peisistratos carried out a purification (catharsis) of the island by removing all tombs from the area round the sanctuary, and in a second purification in 426-425 BCE all births, deaths and burials on the island were prohibited and the existing tombs were removed to the neighbouring island of Rinia (Rhinia). In 166 BCE the Romans gained control of Delos, and thereafter assigned it to Athens. This brought a revival of the island’s prosperity, particularly after the destruction of Corinth. The end came with the devastation of Delos by Mithridates in 88 BCE, followed by its complete destruction by pirates in 69 BCE. Thereafter the island was almost uninhabited, and when Pausanias visited it in the 2nd c. he saw only the custodians of the deserted sanctuary. A fresh settlement was established in Christian times, but this was only a brief life.